Product code: R251 Categories: Sold Items, Sold Rings. 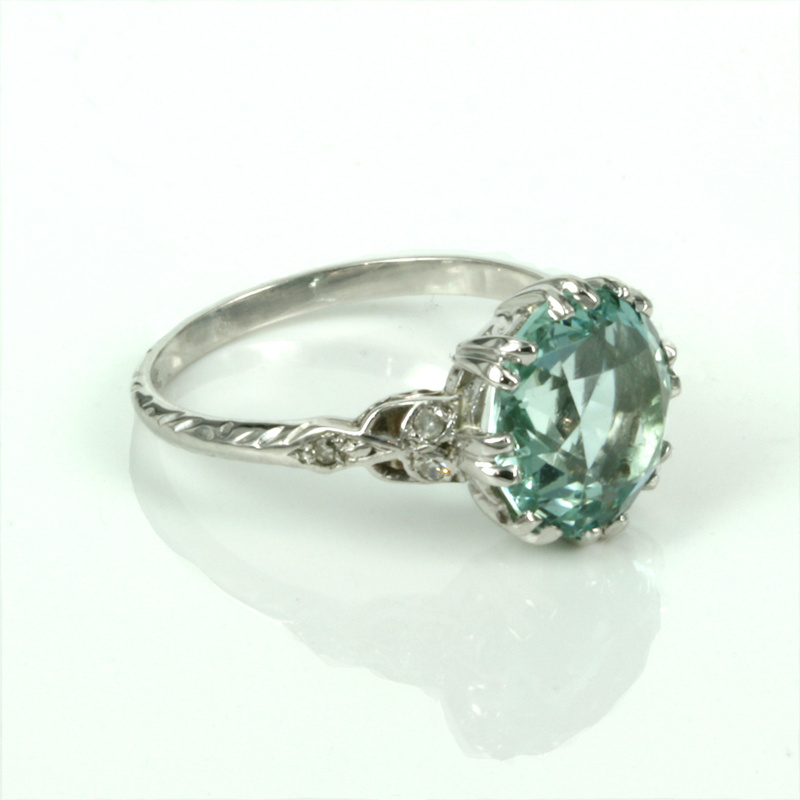 The word “Aquamarine” comes from the Latin word meaning Sea water and was often described as “two handfuls of sea water” and when you see this vintage aquamarine and diamond ring from the Art Deco period of the 1920’s it will be so easy to see why this term is used. Natural aquamarine that has not undergone any heat treatment will often have a lovely blue-green colour and set into the 18ct white gold in this ring really enhances this natural colour. Measuring 4.20 carats it sits proudly in the centre with three more diamonds set on each side for added sparkle but not to detract from the fabulous aquamarine. These diamonds total 0.12 carats and add just the right amount of sparkle. Hand made in 18ct white gold the centre of the ring where the aquamarine is measures 10.9mm and across one side to the other where the diamonds start and finish, this distance measures 15.3mm across. With magnificent detail on the sides that shows the quality of this ring, to the aquamarine which in itself is mesmerising, this is a fabulous ring for all to see when it is worn proudly on the finger.